WVU student Jillian Clemente makes sure the sensors are secure before finding a good spot for them to sit on the creek. With the ongoing water crisis in Flint, Michigan, our nation’s drinking water — and what’s in it — has been on everyone’s minds. West Virginia has also had its share of issues with contaminated water. While the coal industry helps create jobs in the state, it also creates the potential for another water crisis. Paul Baker, with Save the Tygart Watershed Association, stands next to an unnamed tributary of Three Fork Creek that the group has been monitoring with water quality sensors. West Virginia University graduate students Shishira Sreenivas and Colleen Good were part of the WVU Stream Lab experimental journalism project at the Reed College of Media this year. The project tested Do-It-Yourself (DIY) water quality sensors and dug into water issues in the state. This past spring, they focused on a relatively new coal mine’s potential impact on a stream near Grafton in Taylor County. In West Virginia, people have a close relationship to the land and its resources. From the rivers, to the mountains, all the way to the coal underground. For some, their relationship with coal is built on family history and means their livelihood. For Paul Baker, though, coal also means problems. “What you have to realize when you take coal out of the ground and dig holes in the ground and dump refuse in the streams and stuff, you inherently negatively impact the environment. I mean there’s no getting around it,” Baker said. Shishira Sreenivas, center, interviews West Virginia DEP basin coordinator Martin Christ. 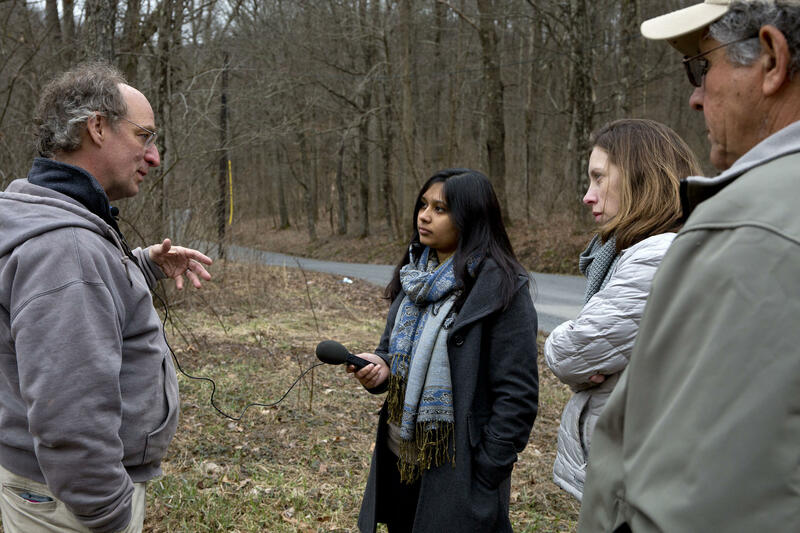 FROM LEFT: Martin Christ, WV DEP basin coordinator; Shishira Sreenivas, WVU journalism graduate student; Emily Corio, assistant professor at the WVU Reed College of Media; and Paul Baker, with Save the Tygart. 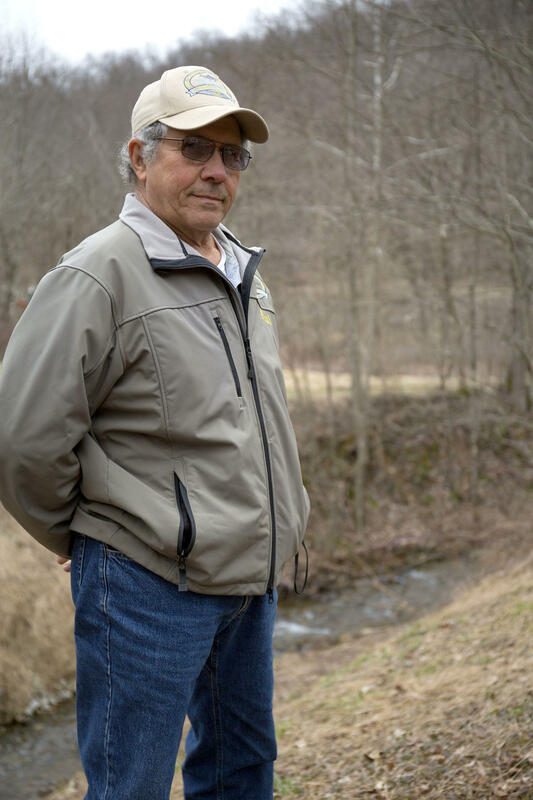 Baker is a retired chemist and works with Save the Tygart Watershed Association. The group monitors the water quality of streams and rivers in Taylor County — an effort members started to fix coal-impacted watersheds. They’re concerned now about a slurry pond — a waste pile that holds a mixture of water and chemicals used to process coal after it’s mined. The pond belongs to the Leer Mining Complex, a longwall mine owned by Arch Coal. It’s also close to Three Fork Creek, a tributary of the Tygart River. The creek where the WVU Stream Lab team dropped their sensors. Save the Tygart Watershed Association has been keeping tabs on the waterway since before the coal slurry pond was installed nearby. 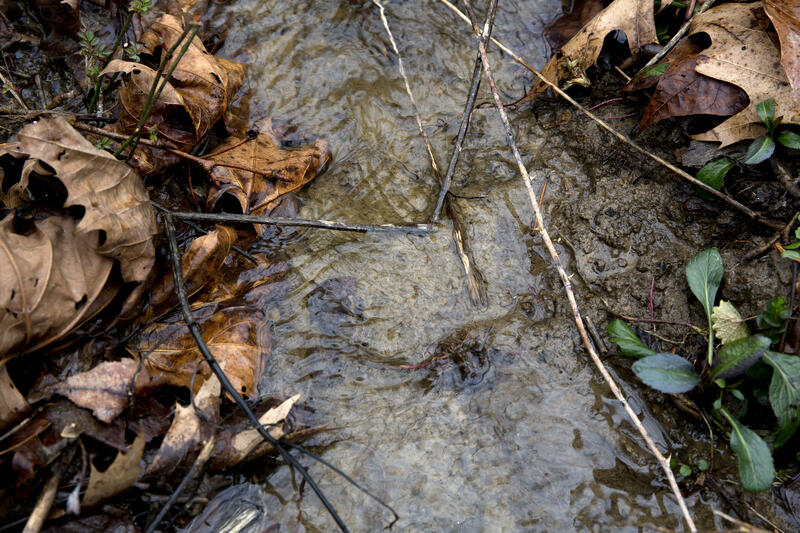 Save the Tygart Watershed Association has been collecting water samples in a creek near the Leer Mining Complex to see if the coal slurry pond could be causing water pollution. But the students wanted to collect their own data. WVU’s StreamLab project taught journalism students, including us and our classmate Jillian Clemente, how to use do-it-yourself water sensors. The project used RIFFLE data loggers with sensors that record temperature and conductivity levels. And we packaged it all in an empty plastic bottle. “By definition, it’s a remote independent field friendly-logger electronic, but it's basically a bunch of wires connected to a little board that's like a smaller arduino. Which a riffle basically just measures one thing over and over again and can log that data,” Clemente said. So the students sunk two sensors into the creek near the mine using marine ropes and a cinder block to keep them in place. After a week, the sensors were retrieved. Unfortunately, the DIY sensors were damaged and the data collected on the Taylor County stream was unusable. But failure is part of any experiment. But what does high conductivity even mean for a waterway? Dr. Nicolas Zegre, an Assistant Professor of Forest Hydrology at West Virginia University, provided some clarity. “Just because it has a high conductivity or low doesn’t necessarily make it a good stream or a bad stream,” Zegre said. “The conductivity that you’re measuring is in the context of everything that’s gone on in that watershed over a period of time. And some watersheds or some streams simply have higher or lower conductivities. “So that’s one of the things the EPA was trying to do related to mountaintop mining and valley fills is understand what conductivity threshold, if exceeded, would be indicative of a degraded stream,” he said. While conductivity tells you something is in the water, it doesn’t tell you what it is. In 2010, the Environmental Protection Agency (EPA) issued guidance on coal mining in Appalachia. It stated that conductivity levels above 300 microsiemens would not properly support aquatic life. If these guidelines had been followed, it would have triggered more scrutiny for Clean Water Act permits. But the U.S. district court for the District of Columbia rejected the conductivity guidance in 2012. Jason Bostic is vice president at the West Virginia Coal Association. He says the only significant evidence EPA has on conductivity’s importance are its effects on the benthic macro invertebrates, or the insects and other small animals living in streams. But Bostic questions whether that justifies hurting coal mining during what’s already a tough time for the industry. 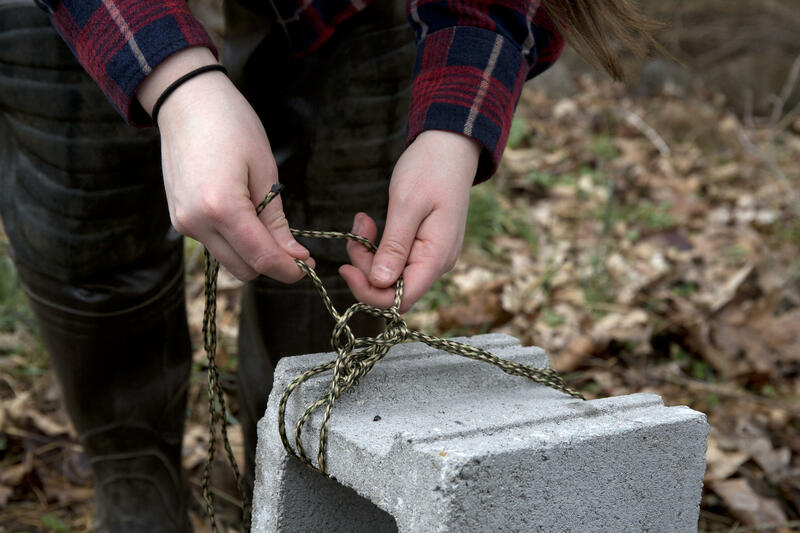 WVU student Jillian Clemente makes some adjustments to the marine rope anchoring the sensors to a cinder block. The rope helps keep the sensors immersed in the water, so continuous readings can be taken. In West Virginia, coal companies are responsible for doing their own water testing, and sending the results to the West Virginia Department of Environmental Protection Office of Mining and Reclamation to show compliance for mining permits. West Virginia DEP basin coordinator Martin Christ said conductivity as a way to measure stream health has a long road ahead. “The DEP is in no hurry to put a standard for conductivity in the rules. And I’d say the Legislature is even less enthusiastic about it,” Christ said. Still, Christ said it’s helpful to have community groups involved in measuring conductivity and other water quality indicators. Repeated requests to interview Arch Coal went unanswered. The state Public Service Commission has set a date for a hearing involving a lawsuit filed against a water company and a manufacturer that sold a chemical to a company involved in a massive spill in Charleston. The Charleston Gazette-Mail reports commissioners issued an order scheduling an evidentiary hearing in the investigation for Nov. 15-17.